The Stallions, the top ranked team in Division-III, improved to 4-0 after a 31-24 win against Bishop Hartley (2-2). Alonzo Booth and Brian Asamoah each rushed for over 100 yards and combined for four touchdowns to help lead the Purple and White. Booth finished with a season-high 163 yards and recorded his fourth straight 100-yard game and seventh as a Stallion. Asamoah had a career-high 100 yards on 10 carries and two scores. 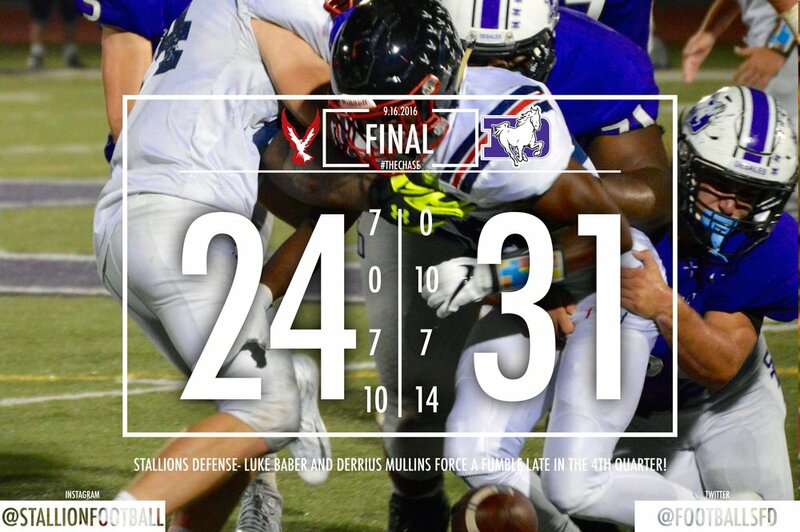 The Stallion defense recovered two Hartley fumbles, which lead to 10 points. Dominic DiMaccio had five touchbacks, a 62-yard punt and kicked a 19-yard field goal for DeSales. Next up, the Stallions will host Covington Catholic (4-1) on September 23, 2016 at 7PM. Older PostChris Thomas - "Where Are They Now?"